Jessica Lee Moore was born January 24, 1984. She is affectionately known to Sam as "Jess." By the time Jessica is 21, she is living in Palo Alto, California, where she shares an apartment with Sam Winchester, her boyfriend of 18 months. She is, however, unaware of his past as a hunter, nor does she seem to know much about his family beyond the fact that he has a brother named Dean Winchester and a father, neither of whom he is very willing to discuss with her. Jessica and Sam met one another through their mutual friend Brady, who is secretly possessed by a demon sent by Azazel and plotting to manipulate Jessica and Sam into a romantic relationship as part of the demons's plan to manipulate Sam to go back into hunting. Sam becomes so infatuated with Jessica that he plans to ask her to marry him. The night of November 2, 2005, while Sam is away with his brother Dean, Jessica is preparing for her boyfriend's return when Brady visits and she lets him in. Brady attacks her, slicing open her stomach and using telekinesis to pin her to the ceiling over her and Sam's bed. 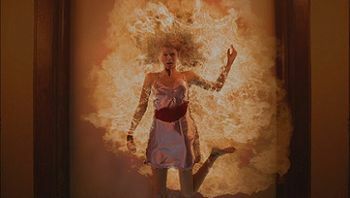 When Sam does return home, Jessica dies when she is pyrokinetically set on fire by Brady, who is hidden from sight to keep his hand in her death a secret. Brady later confirms that Azazel had ordered him to kill Jessica. As a result of Jessica's death, Sam returns to hunting to find and kill the creature responsible; although he initially believes the culprit to be his mother's murderer, Azazel, he eventually discovers that the truth and kills Brady to finally avenge Jessica. Jess is killed in the same manner as Mary Winchester. 22 years ago, Sam, Dean and John Winchester witness Mary Winchester's death. After 22 years Sam has quit hunting monsters and has run off to Stanford University. One night Sam hears something, gets up and walks down stairs and to his surprise, it's Dean. When Sam asks why he's here, he tells Sam that "Dad's hasn't been home in a few days," Sam replies that it's probably not a big problem, but then Dean rephrases, "Dad's on a hunting trip, and he hasn't been home in a few days." Immediately after Dean says this, he kindly asks Jessica to go into the other room. Dean asks him if he's going to come and help find their father and he replies that he swore that he was done hunting and that the reason he quit was his fathers obsession to find the demon that killed their mother. He said that he didn't like it when he told his father that their was something in his closet. This was because he said that his father had handed him a gun instead of saying don't be afraid of the dark. After a while Sam gives in and decides to go and help Dean, leaving Jessica on her own. Sam and Dean think that if there is a case, that their father would have been in Jericho, California. They discover that the case is that of a Woman in White case. After they have destroyed the Woman in White, Sam returns home and Dean stays outside. Sam goes inside and finds some cookies that Jess had made for him while he was gone. When he gets to the bed and lies down, blood drips on his head. He opens his eyes and sees Jess pinned to the ceiling, apparently still alive. She is burned to death when the ceiling bursts into flame. Sam has a nightmare where he is putting flowers on Jess' grave when her hand reaches up from the earth and grabs him. When Sam and Dean are trying to exorcise the Airplane Demon, the demon takes Sam off-guard by taunting him with intimate details about Jessica's death, claiming that he knows what happened to her and that she is "still burning" even in death. At the beginning of the episode, Sam has another nightmare, in which he is reliving her death and hears her repeatedly asking him "Why, Sam?" When the brothers are attempting to trap Mary Worthington's ghost, Sam volunteers for the responsibility of calling her due to his guilt at Jess' death; Dean argues that it won't work as he knows how Sam could have prevented Jess' death, but Sam simply tells Dean that he could have warned her and that he (Dean) doesn't know everything. Dean, alarmed by the intensity of Sam's grief and guilt, tells him that he has to stop blaming himself and start blaming the thing that actually killed her or even Dean himself, since he is the one who dragged Sam away from Jessica. Dean also reveals that Sam has been having nightmares about Jessica constantly and calling out to her in his sleep. Mary Worthington later appears as Sam's reflection and angrily accuses him of being responsible for Jessica's death. She reveals that he had had dreams of Jessica's death days before she died but that he had been so desperate to pretend that they were dreams that he hadn't said anything to her and had "left her alone to die" when Dean came to enlist him for his help in 1.01 Pilot. At the end of the episode, after Mary has been destroyed, Dean again tries to convince Sam to forgive himself for Jessica's death and then asks what the secret was that Sam had used to lure Mary out. However, Sam refuses because there are some things he needs to keep to himself. At that moment, he looks out the car window and sees Jess again, this time when he is awake; she is standing on the street in a long white nightgown. The two of them stare at each other for a long moment as Dean, oblivious, drives away, before the car passes by Jessica and she vanishes into thin air. It was unclear if this final apparition was a vision, a memory, or an actual entity, such as Jessica's ghost. A friend of Sam's from Stanford, Rebecca Warren, is surprised that no one at school had known about Sam hunting monsters, and asks him if Jessica had known, showing that she had at least known about Sam's relationship with Jessica, if she had not known her personally. Sam confirms that Jessica had not been aware that he was a hunter. A romantic attraction between Sam and Lori Sorenson leads to a kiss, but Sam quickly stops it, which Lori intuits is because he lost someone (Jessica) recently. At the end of the episode, Sam declines Dean's offer to stay so that he can have something with Lori. Sam's new aversion to intimate attachments after Jessica is explored in more depth in 1.19 Provenance. Sam admits to Dean that he had visions of Jess' death days before she died. Dean is eager to dismiss them as coincidence, but Sam is adamant that the dreams were too exact to the details of how she actually died - right down to her burning on the ceiling, her blood dripping on him - to be anything other than prophetic dreams. He also admits that he hadn't acted on them because he had wanted to believe that they were just nightmares. In John's first conversation with the boys since he disappeared, he reveals that he knows about Jessica, her relationship with Sam, and what happened to her in the end. He gives Sam his condolences, telling him that he would've done anything to protect him from having that happen to him. Sam is outraged that Dean told Cassie Robinson the big secret about the family business during their short-lived relationship while he had refrained from telling Jessica the entire time they were together, like they had been taught to. It is revealed through Sam's outburst that he and Jessica had been involved with one another for eighteen months before her untimely demise. Meg compares Sam's love for Jessica to the love she herself feels that is part of why she does what she does. Once she brings up Jessica, she begins sexually assaulting an incapacitated and helpless Sam to have "a little dirty fun." Suspecting that the reason Sam won't hook up with Sarah Blake is Jessica, Dean points out that Jessica would want Sam to be happy and have fun. Sam, clearly remembering some fond memory of Jessica, agrees that she would. However, he goes on to say that his hesitation to pursue Sarah is not about Jessica specifically, and later explains because that the people he loves (Jessica included) always seem to die, he has become afraid of becoming attached to anyone else because it might put them at risk. Azazel tells Dean that Sam had intended to marry Jess and had even gone shopping for engagement rings. When Sam demands to know why the demon had killed her, Azazel reveals that it was because she had gotten in the way of his plans for Sam. John, angry that Sam had not killed Azazel when he had the chance, reminds Sam that Azazel had killed Jessica and that he had "begged" John to take part in the hunt for revenge. Jess is alive and engaged to Sam in the wishverse. In Dean's wishverse induced by a djinn, Jess is still alive two years after her death in reality. She and Sam travel to Lawrence, Kansas to celebrate the birthday of Mary Winchester, who is also still alive. Dean greets Jessica with an enthusiastic hug when he realizes that she is alive in this world. At Mary's birthday dinner, Jessica and Sam announce their engagement, which Dean, Mary, and Carmen are all thrilled by. When Dean is about to leave the wishverse, Jessica is among the figures who appear to him in attempt to dissuade him. The cost of doing business, I’m afraid. I mean, sweet little Jessica –- she just had to die. You were all set to marry that little blonde thing, become a tax lawyer with two kids, a beer gut, and a little McMansion in the suburbs. I needed you sharp on the road, honing your skills. Your gifts. While Sam and Dean are talking with the Publisher of the Supernatural series, she mentions that she found Sam's decision to shoot Madison - "the first woman since Jessica he ever loved" - to be a particularly moving part of the series. During Sam's bout of demon blood detox hallucinations, he imagines a younger version of himself confronting him on returning to hunting when he had been poised to finally have the normal life he always wanted, including becoming a lawyer and getting married. Sam reminds himself that he had gone back because Jessica was murdered by demons, but ends up saying that the demons had only killed her because he had run off with Dean and left her alone and helpless; if he hadn't gone with Dean that day, Jessica would still be alive. The younger version of Sam questions his present-day self, asking, "You think Jess would want you to turn into this? She loved you. You think she'd be happy with you using her as an excuse?" Lucifer appearing to Sam as Jess. Jess returns in Sam's dreams. She tries to convince him that he will never change and that those close to him will continue to die, telling him that she was dead from the moment they said hello. Sam has missed Jessica, but is surprised and hurt by her words and ultimately rejects what she says. It is then revealed that the Jessica Sam has been talking to was Lucifer all along, having posed as her to better manipulate Sam. An alternate explanation is that Jess was part of Sam's subconscious, i.e. a dream, which Lucifer then invaded. Azazel was concerned that Sam was losing his potential, and so it was revealed that Brady introduced Sam to Jess with the plan that her death would drive Sam back to hunting; it was Brady who killed Jess, on Azazel's instructions. Clearly his instructions were to make it appear as though Azazel killed her so Sam would recognize the death scene and continue hunting to get revenge. After getting the location of Pestilence out of Brady, Sam kills him with Ruby's Knife and finally avenges Jessica's death. After the Wall is broken by Castiel and Sam's mind is shattered, Jessica is implied to be somewhere in Sam's mental world as he lies comatose. The version of Sam who remembers being trapped and tortured in the Cage with Lucifer and Michael pleads with another version of Sam to go out and find her so that he can live out the rest of his life in his head with her in peace, rather than become whole and remember the atrocities he has been put through. However, Sam turns down the idea because he has to return to Dean so that Dean won't be alone. When Osiris attempts to put Dean on trial for the deaths he has been responsible for, he calls Sam as a witness, arguing that Dean is responsible for Jess' death and Sam's return to hunting; Sam defends this accusation by arguing that Dean couldn't have known what was going to happen to Jess when he came to Sam to get help and that him remaining a hunter is his own choice. Jessica's death at the hands of demons is brought up by Dean when Sam is unsure about if they should try to do the trials to close Hell, as Sam is worried about Kevin's safety and well-being if they were to attempt it. Dean is in disbelief that, after what had happened to Jessica and other people who have suffered because of demons roaming Earth, Sam still has reservations about attempting the trials to lock all demons away. Sam is enraged when he realizes that Dean has played on his fear of death befalling those he cares about by faking an emergency text from Sam's ex-girlfriend Amelia Richardson to keep him away from Benny Lafitte. Jessica is the only one explicitly named by Sam out of the people who have died due to their connections to him. While being mentally tortured by Lady Toni Bevell, Sam sees an vision of Jess' death and calls out to her. Jess shares a birthday with Dean: they were both born on January 24, Dean in 1979 and Jess in 1984, the latter birth date being only two months after Mary's death in 1983. In an interview Eric Kripke said the reason for Jessica and Dean having the same birthday was "...not a creepy, mythology, conspiracy reason. January 24 is my wife's birthday, and it's kinda my valentine to her." Jess is widely believed to have also been a student at Stanford, as that is presumed to be where she met Sam, Brady, and possibly Rebecca Warren. If she was indeed a student, it is not known what she was studying. Jessica's gravestone describes her as "Beloved Daughter," indicating that one or both of her parents were alive at the time of her death. 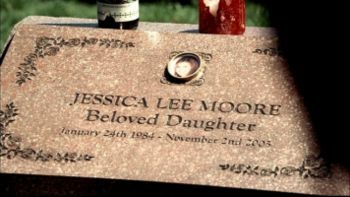 Jess was most likely an only child whose closest relationship in her family was with her parents, as the gravestone only references her parents, rather than further describing her as a "Beloved Sister," "Beloved Granddaughter," etc. Furthermore, the memorabilia placed on her grave suggests that she and/or one of her mourners was of the Roman Catholic faith. "Jessica" was the name of a character in another Kripke work - the girlfriend of Boogeyman's protagonist. The two Jessicas are alike in that they were the girlfriend of a main character haunted by a supernatural past that ultimately catches up to him by killing her. In 14.13 Lebanon, TED Talk Sam from an alternate timeline where John Winchester's disappearance in 2003 caused Sam to never return to hunting, mentions not having enough time for family. This suggests that even in the alternate timeline, Sam didn't end up marrying Jessica. This page was last edited on 10 February 2019, at 04:49.